Deconstructing The Incal lifts the veil on many of the mysteries and secrets surrounding the seminal science-fiction graphic novel, which has become the cornerstone of the Jodoverse.This encyclopedic reference book, is packed with fascinating insights from The Incal's creators, Jodorowsky and Mœbius, alongside revealing text, and rare and unseen preliminary illustrations. 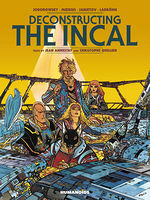 Deconstructing The Incal lifts the veil on many of the mysteries and secrets surrounding the seminal science-fiction graphic novel, created by Jodorowsky and Mœbius, which became the cornerstone of the Jodoverse. This encyclopedic reference book is packed with insights from the creators, fascinating research, and rarely seen preliminary illustrations.